It's odd how Jeff Lemire continues to explore new ground with Green Arrow while simultaneously getting the character of Oliver Queen back to where he should be. It's an odd dichotomy that should have the Green Arrow purist in me screaming in rage. And yet the whole affair is so well presented I can't help but want to see where this book is going, even as I ponder whether or not a shield can properly be called a weapon. The centerpiece of this issue has Oliver finally learning the truth about his father, his family, a mysterious group called The Outsiders and a collection of totem weapons. Naturally The Queen family is affiliated with The Arrow and Oliver's new enemy, Kodomo, is seeking the mystic arrow in order to prove himself more worthy of Oliver's legacy. All of this information comes from the mouth of the mysterious Magus, who also introduces Oliver to another scion of The Outsiders - the current wielder of the Axe totem. With all this talk of mystic weapons and Oliver taking a drug-induced vision quest, one might be forgiven for thinking Jeff Lemire got his scripts for Constantine and Green Arrow mixed up this month. But any fan of Mike Grell's classic run on Green Arrow will tell you that while Ollie is usually a down-to-earth hero he has had his share of mystical adventures. Indeed, one of my favorite Mike Grell stories involved Oliver's visiting Sherwood Forest while being watched over by Herne the Hunter. Lemire's story perfectly fits the mold of those tales but this story also reminded me a bit of the early works of Frank Miller on Daredevil. And not just the obvious connection of Ollie having a blind mentor. No, I make this comparison because I can't think of any superhero revamp in recent memory which so radically changed a character's origins since Miller presented the idea that there were whole ninja clans capable of replicating Matt Murdock's radar-based super-senses through training. 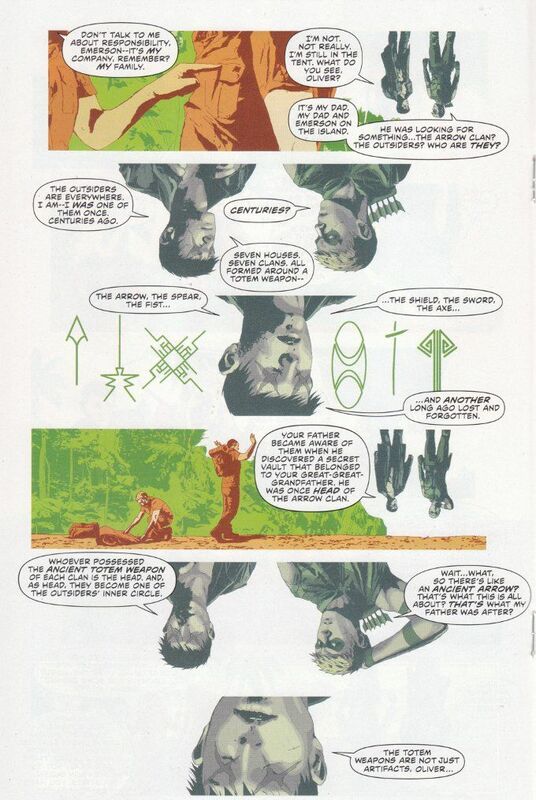 Lemire's concept of The Outsiders as a group of warriors devoted toward the study of a single weapon is unlike anything seen in any Green Arrow comic before. 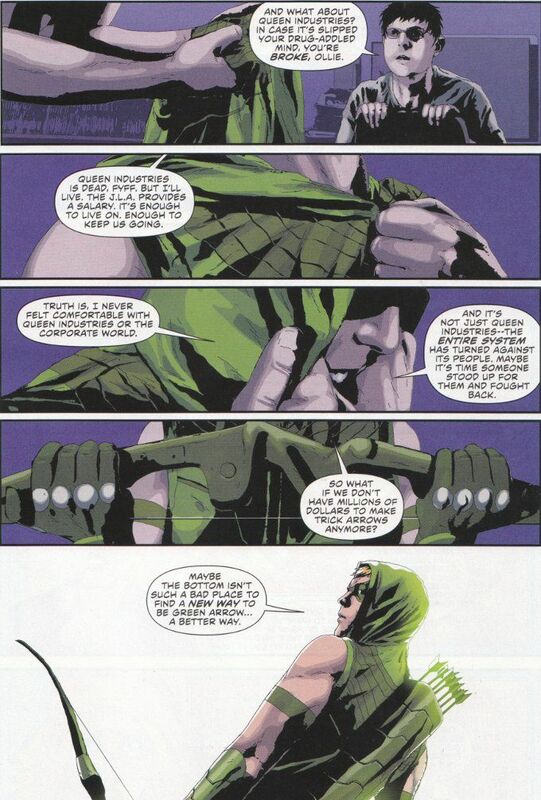 Yet this comic also brings an Oliver Queen more like the hero we had in the pre-New 52 universe. One who sees wealth as a burden and who is as concerned about the welfare of ordinary people as he is about fighting crime. Andrea Sorrentino's artwork is as fine as ever. Sorrentino's style is all his own but I can't help but be reminded of Mike Grell's artistic work with the character, in both the use of shadows to create atmosphere and in the dynamic poses of the characters. The overall effect is amazing and matches Lemire's script well. Take it from a satisfied Arrow-Head of some experience, kids - this book is a must-read. If you're an old-time Green Arrow fan, a newbie attracted to this book by the CW show or just someone who enjoys a good ripping yarn, Green Arrow should be on your want-list.